Find-a-Friend Friday: 45 21 Baby Chicks! Photos courtesy of Animal Kingdom Rescue. Animal Kingdom Rescue in Trenton, Missouri recently took in 45 Leghorn chickens. These sweet little babies were saved from certain death after they’d outlived their usefulness in a local college class. Now they’re all need in of homes! Adopt two or four or twelve, won’t you? Chickens make wonderful friends! These 45 little Leghorn chicks were rescued from euthanasia after a college class. Half of them were hatched on 4-13-12 and the other half hatched on 4-20-12. There is a mix of hens and roosters. 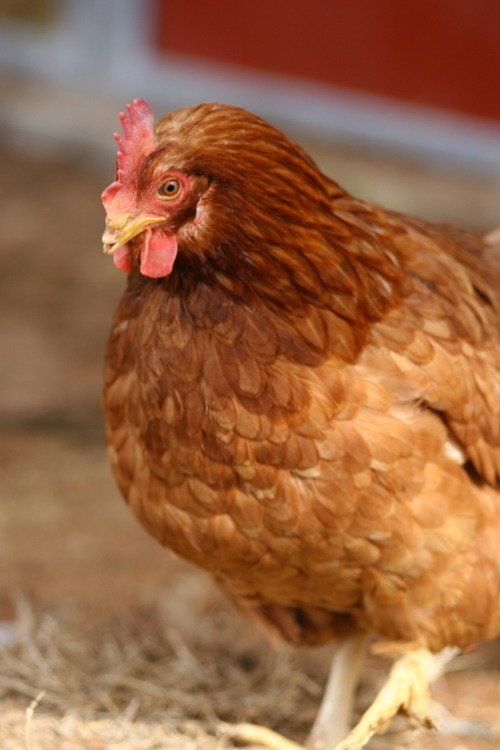 It will most likely be required for each adopter that wishes to adopt hens to adopt at least one rooster. There is a 5.00 adoption fee per chick. All potential adopters will be asked to fill out an adoption application and supply pictures of where the chicks will be housed. E-mail to request a application and include a short summary of your purpose in adopting chickens and a description of the housing you have. Note: The picture was taken on 4-22-12, so the chicks have grown since the picture was taken. Posted: 05/25/12 at 11:00 am. Filed under: Find-a-Friend Friday. Photo courtesy of C.A.R.E. Animal Rescue-Springfield. Kiss a pig? My name is Daphne and I am a real people pig, looking for someone to love! Truly, I’m a pig with a lot of heart. If you have a big heart too, lets get together. I like long walks on my leash and belly rubs. My hobbies are playing with my blue bouncy ball and soaking in a nice cool pool of water. Yummy treats make me talk and beg. I will follow you anyplace. I do enjoy a fine meal, it is a little embarrassing but I get so excited at meal time that I run around and act silly, jumping and twisting, but what do you expect I am a pig after all. If you are wondering about farm pigs, yes we can be loving pets if you have the room. I want a forever home with someone who thinks outside the box and can see me for the sweet heart that I am. I am just a baby now but I will get big and will need a home with plenty of room for me to grow. Pigs are intelligent creatures and make lovely companions, assuming you have the room. If so, please consider welcoming this shiny little soul into your home. She’s every bit as deserving as a cat or dog, dontchaknow! Posted: 12/30/11 at 10:59 am. Filed under: Find-a-Friend Friday. Allow me to introduce you to Larry! Or is this Moe? Hmmm, he could be Curly, too. HSMO used the same photo for all three Bantam roosters and didn’t specify. No matter! I’m sure they’re all equally handsome guys! 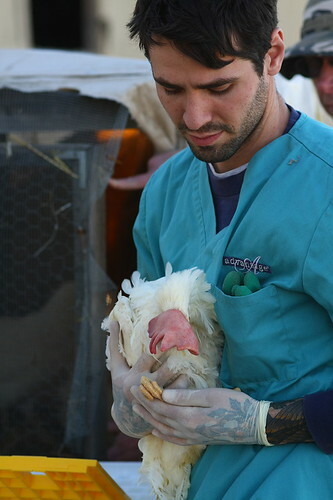 CC image via the Humane Society of Missouri / Longmeadow Rescue Ranch. Seeing as it’s the Thanksgiving holiday weekend, I really wanted to make a turkey our Friday friend in need. Alas, there are none to be found at the Humane Society of Missouri’s Longmeadow Rescue Ranch, the closest major farmed animal sanctuary to Kansas City. Ah well. They do have chickens, though! Close, if not totally seasonal. That’s okay though, since chickens rock just as hard as turkeys. Larry, Moe and Curly are a trio of Bantam roosters who arrived at the rescue ranch together as strays. All three are about a year and a half old, and have been at the shelter since May 2011. The three get on well together, but have not yet been introduced to females. Longmeadow doesn’t specify that the three must be adopted together – but really, wouldn’t that be dandy? Let’s make it happen, people! I am an unaltered male, black and white Bantam mix. The shelter staff think I am about 1 year and 5 months old. I have been at the shelter since May 17, 2011. Shelter Staff made the following comments about this animal: Larry, Moe and Curly all came into our shelters as strays. They were not claimed and are now up for adoption. They get along with each other for now but we have also not introduced them to hens yet. They are very cute and perch in the same order and facing alternating directions every night. I am an unaltered male, black and white Bantam. Longmeadow Rescue Ranch is located on 165 acres near Union, Missouri – a four-hour drive from KCMO. Stop by during their Open House / Adoption Days to meet all the lovely animals who call Longmeadow home: horses, goats, chickens, rabbits, cows, even a parakeet! $15 and a weekend out is a small price to pay for everlasting friendship! Posted: 11/25/11 at 9:45 am. Filed under: Find-a-Friend Friday.